I've done a fait bit of googling and trying out different options, but I can't seem to achieve what I need. I need to be able to take a pdf, convert to a 1200dpi jpg, and then produce a new pdf from there (effectively flattening the pdf). The quality needs to be high. If convert.exe can do this in one go, great, but I'm happy if I can just get a good quality jpg and then worry about converting to pdf afterwards. Can someone help me with the convert command line needed for this? - I've tried playing with -resize, -density, -flatten, -geometry, -resize etc etc and I get varying results, but not the nice high-res jpg I'm looking for, so I'm obviously not understanding them properly. What version of IM, on what platform. I'll assume IM v7. If you use v6, use "convert" instead of "magick". Thanks for your reply - I'm using IM7 by the way. I'll try re-installing and see if that helps. How are you running the program? I showed you commands that you can type at the command line. This means in a command window, aka command prompt, aka terminal, aka console, aka cmd.exe. I'm running via command line. I uninstalled and then re-installed. 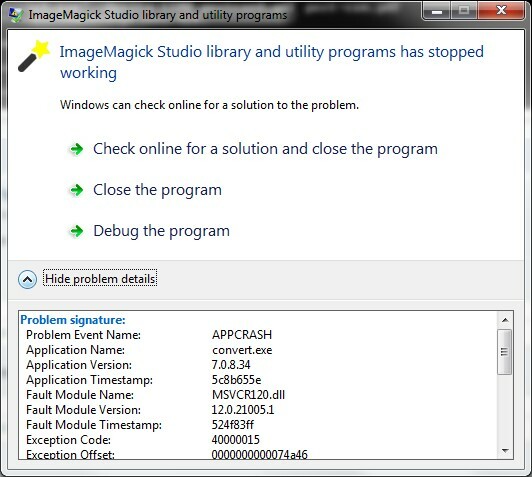 I installed 'Win64 dynamic at 16 bits-per-pixel component' this time, so maybe I got the wrong install file previously? In any case, it works fine now - thanks!